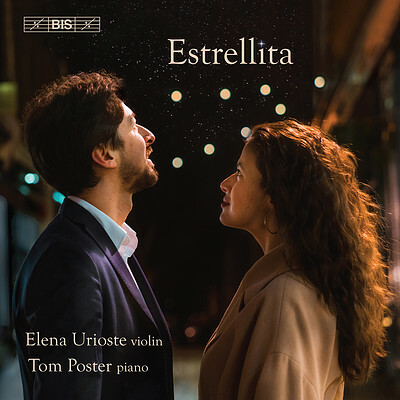 In their liner notes for this string of estrellitas (‘small stars’), Elena Urioste and Tom Poster admit to a shared love for ‘an old-world, golden sound and for melodies that tug at the heartstrings.' This has resulted in a deeply personal collection of miniatures full of winks, sighs and tears aimed at transporting the listener to bygone eras of fireside salon concerts. With a few exceptions, including Elgar’s Chanson de Nuit and Salut d’amour, the pieces are arrangements by the great violinists of that bygone, golden age: Auer, Kreisler, Zimbalist, Heifetz … while the originals they are based upon range from Gluck’s Melodie from Orpheus and Euridice and Liszt’s Consolation No. 3 to Beau soir by Debussy and Estrellita by Manuel Ponce. In a closing section Elena Urioste and Tom Poster also pay their respects to the Great American Songbook, with new arrangements, signed Tom Poster, of Moon River, When I Fall in Love and Over the Rainbow.